Situated in the Haute-Savoie region of France, Chamonix is bordered by Switzerland and Italy and dominated by the incredible Aiguilles de Chamonix mountain chain which peaks at the top of Mont Blanc (4810m) - the highest in Western Europe. The local population of Chamonix numbers around 10,000 inhabitants but this figure swells to nearly ten times that with the influx of tourists, climbers, alpinists, backpackers, students and seasonnaires. There are two distinct seasons here: summer and winter, but the area is busy for most of the year. 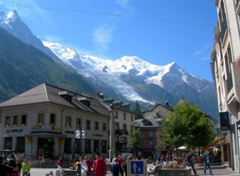 Whilst the principal town is of the same name, 'Chamonix' is often used in reference to the whole valley, stretching over 28km from Le Fayet to Switzerland. It is, however, made up of several distinct and charming villages including Servoz, Les Houches, Les Bossons, Les Praz, Les Tines, Argentiere and at the top of the valley the ancient village of Le Tour. Really good value traditional Savoyardfood. fondue etc. Friendly and huge portions..
Up by the Chamonix train station. Lovely rustic cool pub with a lively atmosphere. This bar is on the square opposite the Post Office. Upstairs is unchanged since the 1920s! the huge art deco windows offer a panoramic view towards Mont Blanc. Le Tour is an ancient village at the top of the Chamonix valley at 1500m altitude with one of the best snow records in the alps and a very sunny aspect with fabulous views of the Mont Blanc Massif, the Aiguilles Rouges and the Le Tour Glacier. It is a traditional Haute Savie hameau with three restaurants and a cafe. The Le Tour lift system at the top of the village has an ESF and takes skiiers (or bikers) to extensive beginners and intermediate areas. 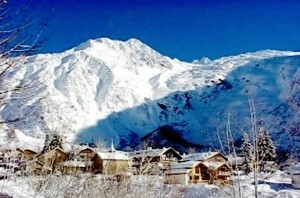 Next to the village is the Vormaine debutante ski area - ideal for small children or those on skis for the first time. In the summer many walking and mountain bike trails start in Le Tour and take you down the valley to Chamonix past the most spectacular scenery imaginable. There is a shuttle bus (free with the carte d'hote card) regularly connecting Le Tour with the rest of the valley throughout the day. Next to the cable car with a fabulous sun-terrasse overlooking the valley underneath the Le Tour Glacier. Owned and run by an eccentric (Basil could not compete) French family as ancient as the hills - truly Savoyard. Hotel, bar & restaurant, next to the Vormaine debutante ski area. Cafe & takeaway near the telecabine. Very busy in season - reservation advised. Argentiere is one of the foremost alpine resorts due to its enviable location at the base of Les Grands Montets - an immense ski area offering an array of pistes for beginner, intermediate and expert skiiers and vast powder fields of off piste in the winter and a universe of extraordinary beauty in the summer. It's height gives it the most reliable snow record in the Alps with good skiing conditions usually through to mid May. The old village is in a spectacular setting towards the head of the Chamonix valley and beneath the Argentiere Glacier. 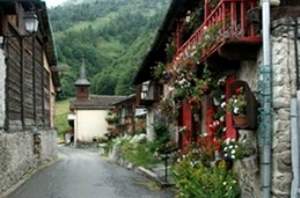 The village retains a picturesque mountain feel with a large number of traditional wooden houses, as well as ancient farmhouses. There is a newer side too with all the modern shops and services, a variety of cosy bars and restaurants. A free shuttle bus runs into Chamonix (4km) from Argentiere every 15 minutes throughout the day. Popular with locals, seasoners, and tourists alike, the Rusticana (or the Rusty as it is affectionately known to regulars) offers great food, excellent beers, wines and spirits and an unbeatable atmosphere. Italian Bar Pizzeria & Restaurant. At the top of the village this bar has a pool table. The Office Bar has lots to offer! Loads of live Sports, SKY TV, live bands, DJs, bar snacks, special events.